Customize your Remote Networking Diagrams with more than 2 000 pre-designed network elements. 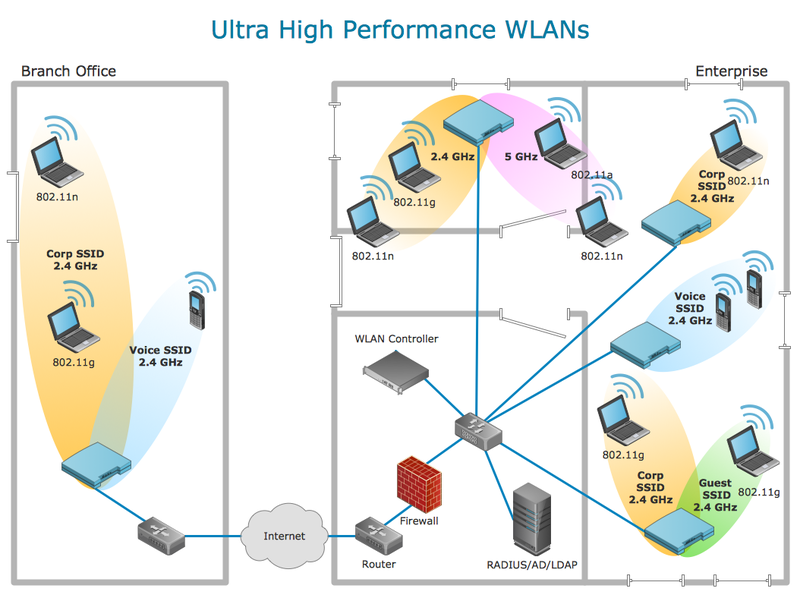 This ultra high performance WLAN network diagram sample is created using ConceptDraw DIAGRAM diagramming and vector drawing software enhanced with Computer & Networks solution from ConceptDraw Solution Park. Computer & Networks solution provides examples, templates and libraries of symbols for drawing remote networking diagrams: LAN and WAN, topology or configuration design of the remote network access for users at remote offices. Perfect Network Diagramming Software with examples of LAN Diagrams. ConceptDraw Network Diagram is ideal for network engineers and network designers who need to draw Logical Network diagrams.